After today, things will be different. In spring, the young starlings start to test their wings, readying to leave the nest and head into the world on their own. And we know mornings are spent staring off into space, wondering how this all happened so quickly. Waiting for those tiny birds to come back. But mostly, they don’t, because that’s what birds do when they learn to fly. They fly and fly and fly, and then settle down and pause for breath and wonder why they left the nest in the first place. Here’s the thing, little birds: you’re never going to have as much free time in the future as you have right now. And do you know what’s going to happen? You’re going to have less time for reading. Fortunately, James Patterson’s got your back. This week is the first week of the rest of our reading lives, according to the marketing copy on the inaugural releases of Patterson’s BookShots—novellas that are “impossible to stop reading.” In the last few months, novellas have gotten big again, and there’s all manner of commentary floating around as to why. People don’t have time for doorstopper epics anymore. The wait between books is too long for most readers to remember who the characters are or what they were doing to each other. And just a few days ago, Wired put up an article about how we’re looking to binge read like we binge watch our favorite shows. Patterson’s no fool, and so he’s heading right for our weak spot: short, sassy, and suspenseful. In fact, let’s start with Patterson. Zoo 2. The Most Dangerous Animal is Man. Earth under siege. Wild monkeys in the streets. Canned food, running out. Who will save us? [Cue dramatic music] Man will save us. Man that has evolved, much like the animals . . .
And really, if you need more than that to sell you on the book, it’s probably because you’re asking questions like, “So, what? Wait a second. 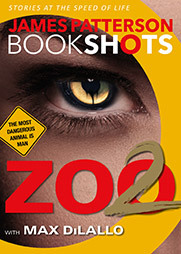 The animals did what with that laser weapon?” And this really isn’t the sort of book that has time to deal with questions like that. Not when there are a gallop of ‘gators about to eat the old ladies at the local nursing home. 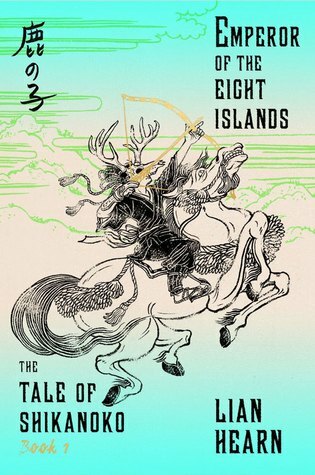 Linn Hearn’s Emperor of the Eight Islands is the first part of The Tale of Shikanoko (and the publisher, FSG, promises to have the remaining three parts out before the end of the year). It’s a book set in medieval Japan, but it is a mythical and mystical and ghostly medieval Japan. Seductive witches! Ambitious warlords! Meddling priests! It’s like Shogun, but in three nights instead of sprawling across two weeks. 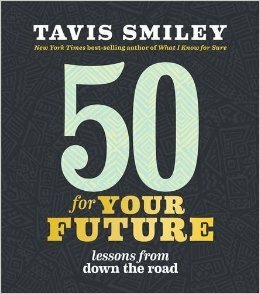 One of the books we’ve got on the graduation table by the front door is Tavis Smiley’s 50 For Your Future. It’s a collection of bon mots and life lessons that Smiley feels we could all benefit from holding more dear. “Fall in love with the possibility of you” is lesson number twenty-four, and it’s a lesson that speaks to all of us, all the time, really. Even when we’re busy flapping our wings as hard as we can. 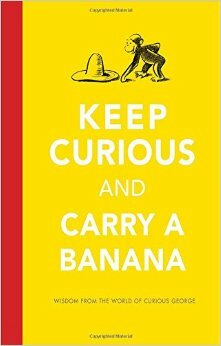 In a smilier vein is Keep Curious and Carry a Banana, life lessons from the world of Curious George and the Man in the Yellow Hat. George suggests that we “just say yes, and sign up for some serious monkey business.” Which isn’t too far from what Smiley suggested. 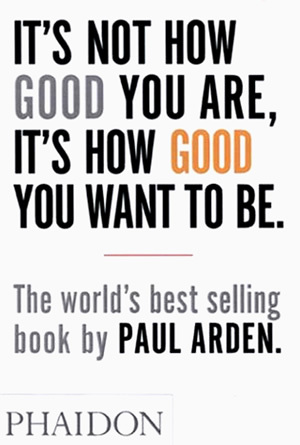 In Paul Arden’s It’s Not How Good You Are, It’s How Good You Want to Be . . . well, we thought it would be in line with today’s earnestness about being a better you for a future filled with more noise and less time, but as we were working on the newsletter, a nice lady came in and asked for a motivational book, and we sold it to her. So, it must be good, right? But, in all seriousness, as we start to get busy with our lives and the lives of all those tiny birds that surround us, we start to think we don’t have time for activities that nourish our own souls, and that’s a terrible idea to let take root in our brains. Give yourself space to escape, dear readers, and pick up a book once in a while. Some of them are short. That doesn’t mean they aren’t any less valuable for what they can do for your soul. Grizzly Adams Lookalike: Can I help you? Colby: I need something to deal with a rodent problem. GAL: Are you an LSD flashback? GAL: A flashback. You know, a delayed psychopharmeceutical reaction to that one time at the Grateful Dead show . . .
Colby: No. I’m not a flashback. GAL: Are you metatextual then? GAL: I know that. But you’re a talking marmot. In a hardware store. Asking about a solution to a rodent problem. Colby: And . . . ? GAL: You’re a rodent too. Colby: Oh, I see. So, what? Rodents can’t have rodent problems? That’s just a human thing? How about pests? Can I have a pest problem? Colby: “Grok?” Is that some local counterculture jargon? GAL: Just Heinlein, dude. Don’t get your fur up. Haven’t you read Heinlein? Colby: I haven’t gotten that far in the alphabet. So, can you help me or not? GAL: Sure, I can help. What do you need? Colby: I’m having a problem with some crows. They’re very territorial, and they’re making noise ALL. THE. TIME. I’m going crazy. GAL: You could shoot ‘em with a BB-gun. Colby: Do I look like I’m equipped to handle a rifle? GAL: No. No, I guess not. Colby: I can’t put out traps because they’re in the trees. GAL: How about an air horn? GAL: Yeah, but it just makes noise. Sure to spook them off. I got one that you can hear up to a half mile away. Colby: I’m going to be much closer than that. GAL: This’ll work, then. Say, they wouldn’t be nesting, would they? GAL: Yeah, you know. Nesting. Raising a family. You blow a horn like that nearby, you’ll probably scare the tiny birds to death. Stop their hearts cold. GAL: Small birds. Frail constitution. Too much noise will just ruin them. GAL: What is that noise? What are you doing? Colby: I’m making marmot noises. GAL: Not in this store, you aren’t. You need to leave right now. Colby: [Sigh] This is why I don’t leave the bookstore.